Today's outfit has to be one of my personal favourites. I just like the colours and the patterns and the subtle colour pop of the arm candy! I wore a similar outfit yesterday for my epic food sessions but decided to wear it again as I did really like the outfit. Yes. I wear outfits more than once! 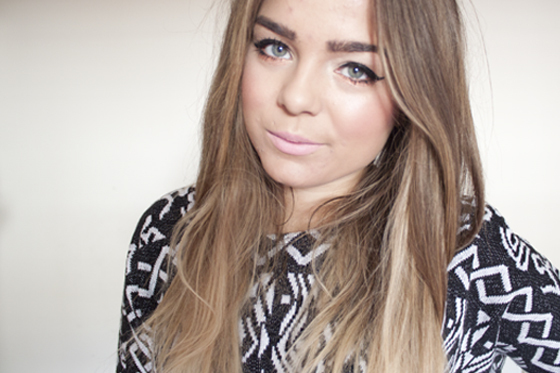 I've worn this Topshop jumper so many times since I bought it a few months ago. I just love it! So versatile and easy to wear. I've worn it with disco pants, and over a midi dress and now with that much loved Primark skirt! I rediscovered this cream jacket a few days ago, I'd never actually worn it and it has been sitting in my wardrobe for god knows how long know! It even had the sale tag still on it! This is why I never buy stuff in the sale! I always forget about them! I think I got it over a year ago now but Im sure Topshop will have something similar this year! I really can't wait to splash out on a few new items one I get paid, I've had my eye on loads of things this month but funds have been so tight (two holidays in such a short ammount of time = money drain!) So I'm excited to pick up some of the things I've had my eye on. Number one on my list at the moment is this jacket from Topshop, I wanted the Zara one but I left it too late and it ended up totally sold out! I also ordered the Night Hawk Boots I mentioned in yesterday's post. I could resist no longer! I love this outfit, and I have always loved your tartan scarf haha. I love the jacket that you want to get from Topshop. I get paid tomorrow... thank christ! I have a million things that I want to get, including heaps of new Models Own polish - thanks to your video lol just kidding. Adore this outfit, the scarf is so beautiful! It's posts like this that make me want to ditch the Shellac! Lurve your nails!! I love the jacket! And that Topshop jacket looks so so fabulous, I've also wanted the Zara one and this looks so so similar, maybe even better! Love this outfit so so much. Seriously take me shopping with you, you pick out so many amazing things that are so versatile! i like your scarf ! Oh I love the coat! The jumper looks great with the scarf! Great clash of prints! That top is lush and the jacket, this is probably one of my favourite outfits of yours too! Great pattern clashing, brilliant outfit as always! honestly, its the simplest nail art i've ever tried! I'm sure thats not a compliment… do you mean fat or orange? Fabulous style lovely, the nails are fab and love the plaid print scarf with the leather look skirt! aaaahhh sounds so good, I've not seen it in real life yet but Im gonna go seek it out tomorrow! I really like the whole look of leather, cream and scarf's check. Quite understand why you love the outfit! oh wow I love this outfit! I keep meaning to buy one of those red tartan scarves & the Topshop jacket you're going to buy is beautiful, apparently Primark have done an amazing dupe of it too!? i haven't seen the primark one in real life or the topshop as a matter of fact. i heard the primark one is a bit plasticy though! you so prettyyy. I love this top and your hair at the moment, it's like a grown-up ombre! love this outfit, i'm so kicking myself for not picking up one of those skirts when they were around! God bless Gem for showing us the way to perfect the leopard nail! I used to have a scarf identical to yours and I loved it so much! I want your scarf oh so bad!! Great outfit as usual! Love that jumper, might have to pick it up come payday! I've been looking around the shops here for a similar skirt with no luck. Fabulous tan too! Oh I absolutely love your skirt and your jumper! Love the jumper! I have that TS jacket coming today! Excited as it had all sold out in hours when it was first released. As much as I love hot weather I do like it being a bit cooler so I can layer. Such a good look for Autumn. Wahhh I love your nails, so pretty and your navajo top is lush. 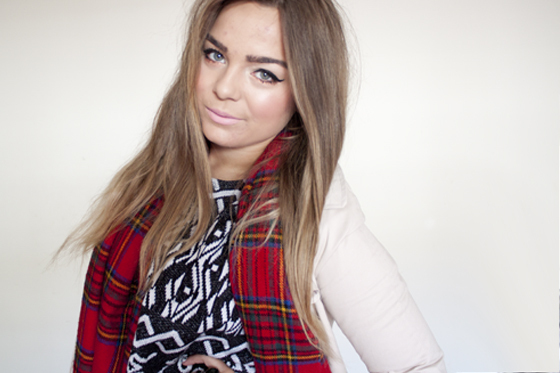 Love how you've styled it with the tartan scarf too, great outfit. Gorgeous top, so jealous of you getting the Night hawk boots! I ordered that jacket from Topshop after missing out on the Zara one too. Unfortunately it's really cheap looking and so not worth £65 in my opinion. Hoping the Primark one you posted about will be a bit better, or at the very least not I won't mind buying it as the price is much lower. Really want that jumper! The pattern is gorgeous!